This unique chapel was built upon the order of Paul Pálffy, together with the monastery. The chapel is consists of two staircases divided by a wall and connected with an upper platform. Through this platform, one can move from one staircase to the other. There are two altars on the platform. The left one consists of a cross with the Crucified and statues of Virgin Mary and St. John at the sides of the cross. The right one consists of a statue of Christ flogged and crowned with thorns. This altar is called Ecce homo – Behold the man. 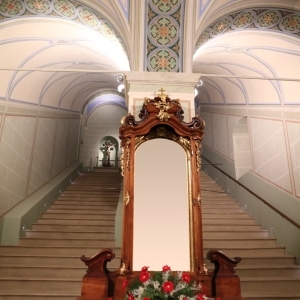 Relics of St. Detherius, Valentine and Beatrix are placed in the stairs. There are twenty-seven stairs and during the service prayers are recited and each stair is kissed before stepping on it in deference of the relics. The staircase on the right side was not always there – it was built in 1902-1903 when a major reconstruction of the chapel took place. Many people come to visit the Chapel of the Holy Stairs, also thanks to the indulgences that you can obtain here to this day. The chapel is open daily always one hour before and during the service. The service is held daily at 7:00 and 18:30 from Monday to Saturday, and on Sunday at 7.00, 9.00, 11.30 and 18.30. 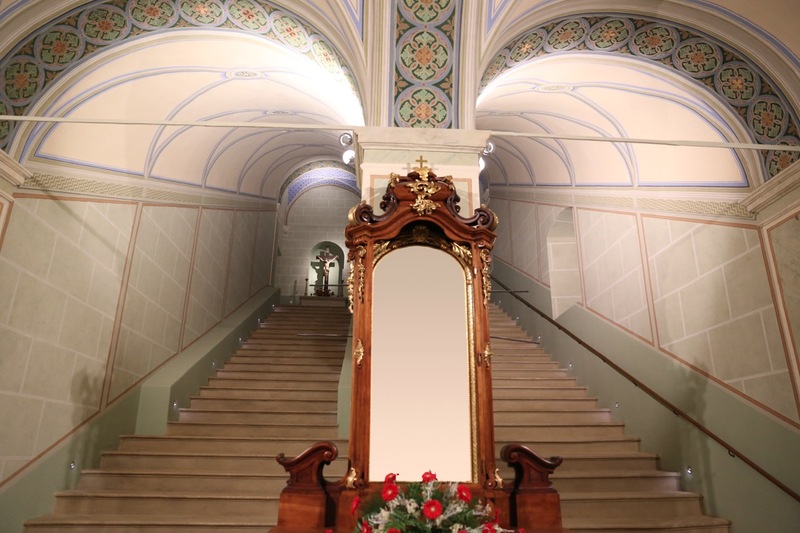 On 9 February 2016, the day before the start of the Lent that year, the reconstructed chapel of the Holy Steps in the monastery in Malacky was consecrated by the Archbishop of Bratislava Stanislav Zvolenský in the presence of fourteen priests and a large number of believers.